a delightful North Pole Elf! "The Night Before Christmas" Series"
well-known poem by Clement C Moore. The Night Before Christmas ...in hopes that Saint Nicholas, soon would be there. This is the first in a new limited edition series, "The Night Before Christmas". 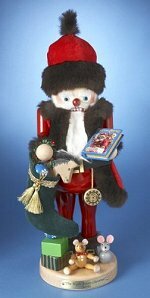 Steinbach has produced this Santa who carries not only a bag full of goodies, but the well know book by Clement C Moore, actually written as "A Visit from St. Nicholas". Limited Edition of 5,000 pieces 17 inches - 43,0 cm Introduced 2012 Made in Germany by Steinbach Volkskunst, GmbH Marienberg OT Gebirge, Saxony, Germany Sorry - RETIRED & Out of Stock! No Longer in Production! 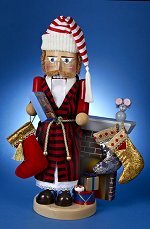 "The Night Before Christmas" Series ...The stockings were hung by the chimney with care. 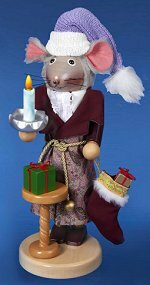 With this third release in "The Night Before Christmas" series, Steinbach depicts the author himself, Clement C Moore, reading us this famous poem actually written as "A Visit from St. Nicholas". This compliments the Mouse and Saint Nicholas released earlier. Limited Edition of 5,000 pieces 17 inches - 43,0 cm 2012-2015 Introduction - All 3 in the Night Before Christmas Series. Made in Germany by Steinbach Volkskunst, GmbH Marienberg, OT Gebirge, Saxony, Germany All three nutcrackers priced as a collection. Santa not available until 2019. FREE Shipping! Sorry - S1931 is RETIRED & Out of Stock! No Longer in Production!